This temple in Thailand is not remarkable, but the very famous in Goldenbuddah in Sukhothaistyle is. It is three meters high and weighs 5.5 ton of pure gold. The figure has a very special history. It was discovered by chance in 1933, when the Danish East Asian company would expand Bangkok's port into an ancient temple area. Among the ruins they found two Buddha figures that were removed. 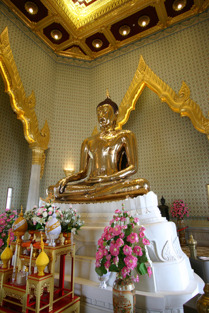 One was of bronze and was moved to a temple o Thonburi, the other one was believed to a very large plaster Buddha. It was moved to Wat Traimitr, and they left it in a shed for 20 years. In 1953 it was decided to move the unusually heavy plaster figure with a crane. While working with the shipment broke the hook and the plaster which over the years has become soft all of monsoon rains, burst so that parts of the goldenbuddha became visible. Scientists say that the figure is between 700-800 years old and that it had been covered over with plaster at the time when the Burmese invaded the country. After the War, they probably either forgotten to unveil the figure or decided that it was safest to have it hidden for some more time. After the discovery of goldenbuddha they decided that it was not worth moving it and that is why the temple is more simple.